October has arrived and that means the start of Breast Cancer Awareness Month which is an annual international health campaign organised by various breast cancer charities every to increase awareness of the disease and to raise funds for research into its cause, prevention, diagnosis, treatment and cure. Every year nearly 55,000 people are diagnosed with breast cancer in the UK, that’s the equivalent of one person every 10 minutes and 1 in 8 women in the UK will develop breast cancer in their lifetime. These are damming statistics that have made people sit up and take notice. A variety of activities and events will be taking place with the aim of raising awareness and funds to battle the disease. Beauty brands will be getting involved by creating products specifically for the campaign with the proceeds going towards the cause. Drawing on the theme pink, these products will be used to raise funds to donate towards various cancer charities. 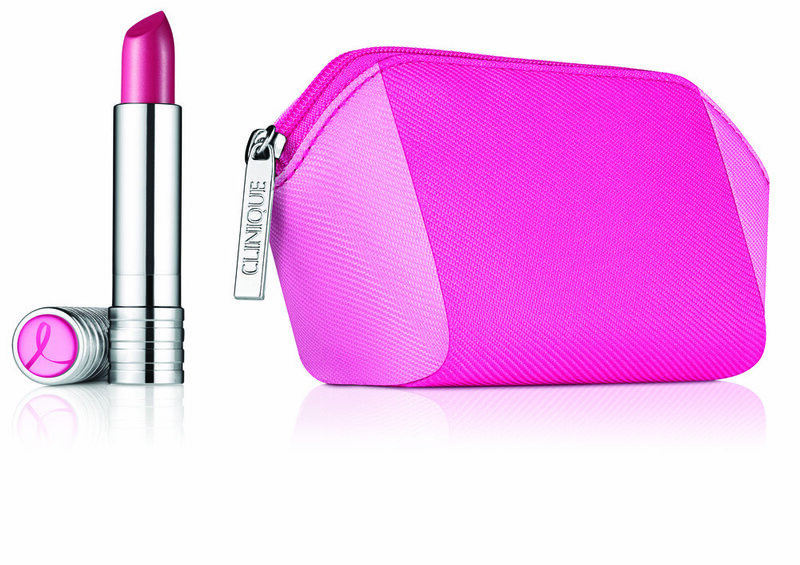 Clinique If you are a lover of pink lipsticks then you will be happu to hear that Clinique have launched the Long Last Lipstick in Power in Pink which is limited edition. It is housed in a cute pink cosmetic purse. The powerful pink hue provides a wash of colour with a creamy, comfortable formula to create an incredibly smooth, even colour that stays true and stays put. £2 from every purchase will go to the Breast Cancer Research Foundation. Estee Lauder This iconic brand has been a firm supporter of breast cancer awareness since 1992 and this year their campaign will be stronger than ever. They have launched the Evelyn Lauder Dream Collection in support of the Estée Lauder Companies Breast Cancer Awareness Campaign. It consists of the Evelyn Lauder Dream Compact, Evelyn Lauder Dream Pin, Evelyn Lauder and Elizabeth Hurley Dream Colour Collection and the Advanced Night Repair Synchronized Recovery Complex II with Pink Ribbon Keychain. QVC This is the 15th year that QVC have been involved with Breast Cancer Awareness Month and they will be selling a wide range of products created specifically for the cause. Darphin In recognition of Breast Cancer Awareness Month, Darphin will be donating £5 to the Breast Cancer Research Foundation’s study at the UK Institute of Cancer Research for every limited edition Intral Redness Relief Soothing Serum sold in the UK during the month of October. Bobbi Brown In a bid to help women go from pretty to pretty powerful, Bobbi Brown will be releasing the limited edition Pretty Pink Ribbon Lip Gloss Collection, featuring four Lip Glosses in varying pops of pink. The glosses come in Pretty Pink Sheer, Pink Tulle High Shimmer, Pink Ribbon and Soiree Pink Shimmer. Bobbi Brown will donate £5 from every sale in the UK to The Breast Cancer Research Foundation® (BCRF). Elemis This luxury brand have created a special edition of their best-selling Pro-Collagen Marine Cream featuring an embossed silver lid that shows the hero marine ingredients. The iconic moisturiser comes with a pretty pink pouch. Aveda This traditionally healing brand have released a Limited Edition Breast Cancer Awareness Hand Relief which is a rich hand creme which softens and smoothes. It is designed with an iconic pink cap and pink ribbon symbol to help raise funds and awareness for the breast cancer awareness cause. £3 of the purchase price of each Hand Relief sold in the UK and Ireland will be given to support The Breast Cancer Research Foundation® in their cruelty free research to help find the cure for the most common form of cancer for women. Origins This popular brand will donate £2.50 from every UK purchase of the limited edition Drink Up Hydrating Lip Balm in Berry Splash to The Breast Cancer Research Foundation. Smashbox Bold makeup brand, Smashbox have released a limited edition shade of Be Legendary Lip Gloss inspired by the iconic pink Breast Cancer Awareness ribbon. Smashbox Cosmetics is donating £5 from the UK purchase of the lip gloss to the Breast Cancer Research Foundation. STEAMCREAM On the skincare side, STEAMCREAM are donating 20% to charity for every pink tin marked with a ribbon purchased on their website during October. Their donations will go to Look Good Feel Better, an international cancer support charity, offering support and services for women and teenagers suffering from the visible side effects from cancer treatment. Crabtree & Evelyn Selected products from Crabtree & Evelyn’s Tarocco Orange, Eucalyptus & Sage, Rosewater and Pear & Pink Magnolia collections will be available to buy with a £1 donation made for every one of these products sold in-store and online. Timothy Dunn London If you are after a special treat, Timothy Dunn London have released the Blue Rose Limited Edition Pink Candle specially for breast cancer awareness. All of the proceed made from the sale will go to the cause. For more information about Breast Cancer Awareness Month please visit the website.